"Today's Technology, Plus Years Of Experience"
Whatever your event, I will do my utmost to make it a success. I have the equipment to cope with almost any venue, have many years experience, a large music collection from the 50s and before, up to the present chart. I am happy to work alongside other entertainers, and will try to ensure that the function flows as seamlessly as possible from that aspect, by the most suitable method. I can cover most functions, and welcome your playlist input should you so wish. I am happy to do themed functions, eg 60s, 70s, 80s, Tamla Motown, or whatever is needed. If you're unsure about anything to do with your function, or what I can offer, get in touch, as I'm always happy to share information and advice. Required by many venues, Excalibur Mobile Disco has a current PLI policy with AMP DJ in the amount of £10 million. Also required by many venues, Excalibur Mobile Disco has supplied satisfactory evidence of holding current PAT inspections of their equipment dated within the last 12 months. A Method Statement outlining Excalibur Mobile Disco&apos;s Health & Safety procedure for setting up disco equipment has been provided. Why do people choose to book Excalibur Mobile Disco? He contacted me very quickly. All information was provided. "The dj was very good would recommend him to other people. The reason a low score has been given for audio equipment is the microphone didn't work properly during my speech other than this excellent lighting and solid songs thanks a bunch for making my 21st one to remember "
"It was a great night, with lovely guests, and a brilliant request list. There was no fault with the microphone at all, merely that it could not be turned up further due to your proximity to the speakers where you were standing. An unfortunate problem, sorry. " "Highly recommend! Peter is very friendly and made an excellent DJ for our party of 70+ guests! Thank you! I would book Peter again!" "Thank you for your kind words. Your parents anniversary was a lovely function in a lovely venue, helped by glorious weather. Your niece's Scottish dancing was the highlight of the event, and I'm glad I was able to help with the celebrations. " "DJ was excellent, supplied all request asked for before event and on the night. Very friendly and made our birthday go with a swing . I would defiantly use them at a future event and would without reservation recommend them"
"Thank you for your kind comments, your family were lovely people, who danced non stop all night, every DJ's dream. " "Peter was amazing all the way through the process with great communication and a friendly face. Great performance throughout the night with a fantastic range of music for all the guest who were up dancing the night away would highly recommend Peter to anyone. And will be contacting Peter in future for all events thankyou for a great night "
"Thank you for your praise. I must say that it was a pleasure to deal with you and your family and guests. The young ones wanted to party from the word go, and really kept us busy. It was a lovely evening all round. " "Absolutely Stellar. 10/10. Would recommend to all. Thanks for a perfect evening." "Thank you for that, it was a lovely relaxed evening, with some very appreciative guests. " "Excellent service. Did everything we requested even at very short notice. Thank you very much"
"Thank you. You picked a lovely venue, and the whole day had a lovely relaxed feel. We had a great time and lots of fun providing the music for it. " "The disco was utterly perfect. He finished off a fantastic day with a well rounded and extremely proffessional service. " "You planned a very lovely and individual day, and I was pleased to be part of it. The venue not only looked lovely, but was also very easy to work at. Your guests were lovely, and you obviously knew them very well, as evidenced by your clever timings, which made the whole thing an absolute pleasure for me. " "Pete made my night providing entertainment with lots of laughs and excellent night enjoyed by all. I would recommend to anyone no matter what the event as he's guaranteed to make your night a good one. " "Thank you for your lovely comments. The whole evening was superb, and the clothing game was an absolute hoot to watch, and doubtless to take part in. I'm glad you and your guests had a good time, I certainly did. " "Brilliant couldn't fault him and everybody who turned really enjoyed the night and music"
"Many thanks for your kind words. The whole evening had such a lovely atmosphere, and I really enjoyed myself too. " "PETER AND MATTY Absolutely fantastic! My guests absolutely loved every minute thanks to these dj's. Got them wrote down in a book for my next event. Absolutely perfect and would highly recommend to everyone. When guests asked for music requests they got them up for us straight away. Fabulous night and can't thank them enough!!!" "Thank you for your kind words, it was a lovely atmosphere, and we were glad to help you enjoy the party. We enjoyed ourselves immensely, your guests were lovely"
"Thank you Peter for helping make my birthday party memorable, you adapted to all my changes of plans throughout the night with a smile. I would recommend you for any event." "Your party was a lovely affair, it was most exciting wondering what would happen next. I'm so glad you and your guests enjoyed it, I certainly did. Thank you for your kind words, they are much appreciated. " "We were very pleased with our DJ, Peter, He played all our requests and our guests really enjoyed the evening as did my Husband whose Birthday it was. Thanks Peter!." "I'm glad you all enjoyed it. It was a lovely relaxed family occasion, and very pleasant. " "I was very happy with Peters communication, he was friendly, funny and helpful right from the off. The arrangements were simple and easy, and I thought the entire thing was very good value for money. On the night Peter was perfect, there was a lot of singing along and dancing, it was a very happy and positive evening, which to say it was a leaving party as we had all been made redundant was pretty impressive. The only complaint I got from my guests was that the night ended too soon! (venue's rules not ours) I would definitely recommend Peter and Excalibur Mobile Disco to friends. Thank you." "Thank you for that. Between you and me, I wouldn't have minded the night going on a little later, either, but that just wasn't an option. Your colleagues were determined to have a good time, and I'm glad I could help them to do so. All the best to you and your colleagues in the future. " "Peter impressed me from the start by his professionalism and I selected him over the other choices as I felt confident he would deliver to my requirements. I was correct. He was extremely helpful, flexible, knowledgeable and friendly. He visited us and discussed the options and our requirements for music during the wedding ceremony, the wedding breakfast and afterwards for dancing. He exceeded our requirements. He recced the venue in advance, brought his equipment down the day before, set up very early on the day and remained providing music up to midnight. He was the unsung hero of the event. His charges were very fair, indeed considering the time he gave us they were generous. He was outstanding and I recommend him without reservation. " "I'm blushing. Thank you so much for those very kind words. It's just a question of doing whatever is needed to make the day run smoothly, and my job on the day easier. You and your family were a pleasure to deal with, so organised yet relaxed. Thank you. " "Peter was superb, very friendly and helpful and made the event memorable. Would definitely recommend!" "Thank you for your kind words. The afternoon had a lovely atmosphere, as family occasions often do. A lovely relaxed occasion, very enjoyable for me." "Very good DJ, excellent manner and would recommend anytime." "Thank you. It was a lovely atmosphere, and a thoroughly enjoyable evening." "Had a fantastic night. All songs requested were played plus request from guests." "Thank you, Im glad you enjoyed it. I had a great time myself, all of the staff and guests, and particularly the band, were an absolute delight to work with. The venue was lovely, and we were blessed with lovely weather. A lovely event all round." "really nice guy, played the music I wanted, mostly lol. very, very happy.would def use him again"
"Thank you for your kind words. I enjoyed playing your requests immensely,"
"Pete was great - setup with no fuss; managed a great playlist- an absolute asset to the evening. Can't recommend highly enough. Would definitely use again!" "Thank you for that. The venue and the staff were lovely, and I really enjoyed the playlist and requests. The birthday boy and I seemed to be singing from the same hymn sheet, he was brilliant. It was a pleasure from start to finish." "Fantastic night and amazing service!! Thank you so much"
"Thank you. You chose a lovely venue for your wedding, and it was a pleasure to provide the music for it." "Thank you. Yours was one of the functions I most looked forward to doing over the festive period. Playing your requests was a pleasant change from the more seasonal fare, and I enjoyed compiling the music in readiness. The venue was very nice, and I must say the staff were an absolute pleasure to work with." "Peter was an absolutely fantastic DJ, he played all the songs on our request list and was more than happy to take requests through the night, he was pleasant and courteous throughout and nothing was too much trouble. I will definitely book Peter for any event we have and we are looking forward to booking him again for our next party." "Thank you very much. It was a beautifully relaxed affair, and I enjoyed it immensely. The guests were certainly up for some fun, especially " Freddie Mercury ". Providing him with a vacuum cleaner was magic. It was a lovely atmosphere, and venue." "Very very good value for money, the dj was happy to do things as we asked and arrived well in advance to be setup in time for the event. The dj was evern more than happy to call the raffle." "Thank you very much. I loved the Christmas pullover theme, and would have worn mine, had it been in the van. Maybe next year. Your requests were eminently sensible, and no trouble at all. Calling the raffle was the least I could do, after the young lady running it had kept me fed and watered all evening." "a very nice and reliable professional person"
"Thank you, it was a great night all round. The singer was superb, and a pleasure to work alongside. I thoroughly enjoyed myself, and it seemed that your guests did too. Regards,Peter." "Peter was fantastic. Lots of people spoke to him and told him how good the music was. He played everything that was requested. Brill guy and fab disco. Would certainly book peter again if the need arose"
"It was a pleasure to deal with you and your family and guests. The night flew by. Thank you for the splendid buffet, it was appreciated. Regards,Peter"
"Peter was just great........really made my 50th a night to remember. I would highly recommend him!" "Many thanks for that. Your friends and family brightened up a dull and rainy night. I enjoyed playing the games with them very much, we all had great fun. Regards, Peter." Excalibur Mobile Disco also offers a range of additional party services not directly linked to musical entertainment. 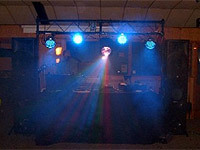 Get FREE no-obligation disco quotes from Excalibur Mobile Disco and other DJs covering your venue. Take 2 minutes to fill in some basic details and we'll do the rest! If you are contacting Excalibur Mobile Disco about an event, it's always a good idea to include the DATE, LOCATION, EVENT TYPE, AGE GROUP and TIMINGS to speed things up!